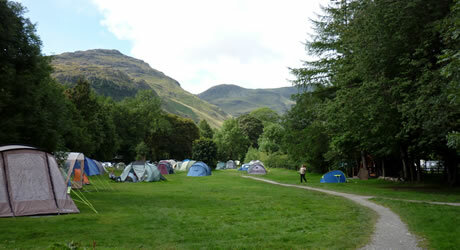 The Great Langdale campsite has good, well-maintained facilities including a couple of shower and toilet blocks, washing up areas, and a small shop selling maps, walking information and basic food supplies. The Old Dungeon Gyhll Pub is 5-10 minutes' walk from the campsite (take a torch) or there are a number of good pubs a short drive away such as my favourite, the Britannia in Elterwater. Although a popular campsite, campers are not packed too closely together and even in August we had a lovely corner pitch with plenty of space between us and the neighbouring tent. Cars can be parked near pitches but not adjacent to them which works well as it means cars are kept off the camping fields. A stay at this National Trust Campsite at Langdale is highly recommended both for experienced campers or for occasional campers. This entry was posted on Friday May 20th, 2011 at 5:30 PM and is filed under Places to Stay.You can follow any responses to this entry through the RSS 2.0 feed. You can leave a response.